The first comprehensive coverage of this unique and interdisciplinary field provides a complete overview, covering such topics as chemoenzymatic synthesis, microbial production of DNA building blocks, asymmetric transformations by coupled enzymes and much more. 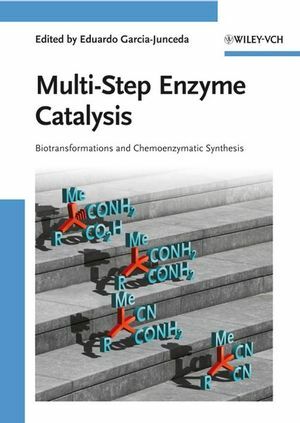 By combining enzymatic and synthetic organic steps, the use of multi-enzyme complexes and other techniques opens the door to reactions hitherto unknown, making this monograph of great interest to biochemists, organic chemists, and chemists working with/on organometallics, as well as catalytic chemists, biotechnologists, and those working in the pharmaceutical and fine chemical industries. Eduardo García-Junceda received his PhD at the Plant Physiology Department at the University of Madrid. He joined Chi-Huey Wong's Group at The Scripps Research Institute (La Jolla, California) as postdoctoral fellow. After his return to Spain in 1995, he was appointed Research Staff Member in the Institute of Organic Chemistry of CSIC in 1997. His research interests concentrate on molecular biology applied to organic synthesis and enzyme catalysis.